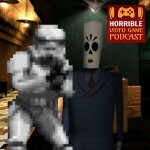 Jason helps Justin kick off a new Horrible Night podcast with the latest in old Star Wars video games. Zombies, nuclear thrones, the grimmest of fandangos show up before GTA gets delayed and Telltale turns to TV. Plus a Nintendotoaster.